Last week a Peace Now report was released stating that their were 285,000 Jews living in Judea and Samaria (and not including East Jerusalem which pushes the number closer to 500,000). The report indicated a sharp increase in Jewish residents. While this Peace Now report would normally be considered good news, there is even better news. Right afterward, the Ministry of the Interior released their numbers, and they are even better, with 297,745 Jews living in Judea and Samaria, and over 550,000 if you include East Jerusalem. Amana (which assists residents trying to buy housing in Judea and Samaria) says the number has already surpassed 300,000. During Olmert's terms (since 2006) we saw an increase/influx of some 45-50,000 Jews, and new construction was up 43.1% in just 3 years (in Little Israel new construction was down 6.9%). There hasn't been such a jump since 1967. (You might even be tempted to say that Olmert was good for Judea and Samaria). Furthermore in 2007 (no data yet for 2008), 59,861 Arabs took a positive step to creating Peace in the Middle East, by permanently moving away to live in other countries. It is presumed that even larger numbers left the West Bank in 2008. Since 2005, 25,000 Arabs permanently left Gaza (3 times the amount of Settlers expelled in 2005), but since closing the passageway none have been able to escape to better living conditions. Certainly this is a positive indicator that Benny Elon's "Right Road to Peace" is on the right track, and if we want real peace in the Middle East, all the money being wasted right now (the Wall, UNRWA, etc.) should be given to the Palestinians to relocate instead of perpetuating them as refugees. This part is true: Bibi Netanyahu has said he wants to form a coalition with either Labor or Kadima, and he doesn’t want to form a coalition with the extreme Right wing. Consider this: Labor has an opposing economic and security outlook from the Likud. Kadima has an opposing security outlook from the Likud and a mixed-up position on everything else. 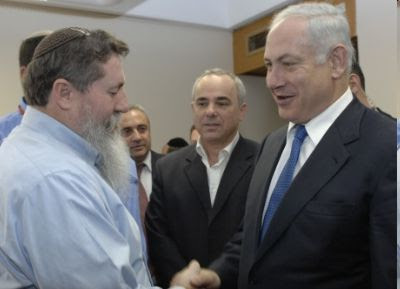 Shas is certainly going to try to extort Bibi like always. Can a functioning coalition be formed with partners like that? Bibi goes to the Jerusalem Conference to speak. As it happens, he bumps into Katzalah of Ichud Leumi, and they get to talking. Katzaleh: You know you are going to have a tough time with the coalition you are trying to form. Bibi: I need to form a large and stable coalition. Katzaleh: Large it may be, but stable? Everyone there will have their own agenda. You won’t be able to count on their vote, unless you buy them off with something they want – every single time. They’re all going to make trouble for you. Katzaleh: Well, I can certainly offer you a number of guaranteed votes on all your important issues. Bibi: [Interest piqued] How’s that? Katzaleh: Our interests and platforms are aligned in so many areas. And you already said that you plan to allow for the needs of “Natural Growth” in our Settlements. Katzaleh: I’ve got one simple condition. I want Ichud Leumi in the government with a ministry, preferably the “Building and Construction Ministry”. Katzaleh: Until you try to uproot settlements, we'll support all your proposals. Bibi: But I don’t plan to uproot settlements. And won’t you be making other unreasonable demands or threats along the way? Katzaleh: Bibi, we’ve known each other for a long time. You know I am a pragmatist and a man of my word. Our interests are aligned. We want to improve the economy. We want to improve the education system. We want to fix the judiciary - though not like Dan Meridor does, but your own people said he doesn’t represent the Likud’s view in that. Help us, and we’ll prop you up against your other partners who are going to make a lot of trouble for you. Bibi: Hmmm. 10 guaranteed votes in the Knesset, and another 1 or 2 in the cabinet. That sounds like a good deal for both of us. We’ll talk more right after the elections. Now wouldn't that be an interesting conversation? Once again the Left is lost in their delusional alternative reality. "It's not going to be easy. But this is the only solution," she [Livni] replied. "But you know that there are settlers who say, 'We will fight. We will not leave. We will fight,'" Simon asked. "So this is the responsibility of the government and police to stop them. As simple as that. Israel is a state of law and order," Livni said. Honestly, how stupid can Livni be? Doesn't she remember that just last week she failed to win a war against terrorism resulting from the government expelling all the Jews from Gaza? It's a cult for these people. We were in Bnei Brak today, in a small, home appliance store. We had some questions about a particular kitchen appliance, and specifically about what was included in the box. Quite naturally we asked the owner. Quite surprised by the question, the owner asked us, "Why didn't you just open the box to look for yourselves?" Only in Israel Bnei Brak. After my wife trashed her computer with an email virus a few months ago, I finally got around to retrieving her data and reinstalling Windows (I got tired of her using my laptop). I've heard so much about Windows 7 lately that I have been seriously considering trying it, but I didn't want to test it out on my work computer. Too risky. So last night I installed Windows 7 on my wife's 5 year old Pentium. Now this isn't a computer that Vista wanted to install on, so I didn't know what would happen or if it would even work. The installation went smooth (I chose to format the entire system as I wanted to kill the virus too). And within a short time Windows 7 was running. And might I add, running fast. The part that took the longest time was finding the right drivers for either of my network cards (until I finally found the right model name in the documentation in the back of my closet) as it didn't recognize either network card automatically. So until I got the driver installed I didn't have internet access. But once I did, Windows 7 started to look on the internet and installed various other missing components. True the computer is empty, but it feels like it is running faster than my top of the line laptop with Vista installed - even after I just bought it. And it boots and shuts down quickly too. After I play with it a bit more I will report further on Windows 7, and decide if I want to take the risk and install it on my laptop. One thing I will say, I think Microsoft should give Windows 7 away for free to all Vista owners as a free upgrade (Service Pack 2?). Even from my few hours with it last night, it is clearly a major step up from Vista (which I happen to like by the way, despite that it is heavier than XP). Obama has already taken his first in a series of bad steps towards Israel. In earlier posts I highlighted Obama’s statements in Jerusalem Post interviews that clearly showed that he doesn’t respect Israel or our right to be in our land (and how he justified Arab violence against Israel), and within his first few hours of officially being in office he backed up his words with actions. One of his first actions was to appoint George J. Mitchell as his envoy to the Middle East (his first phone call was to former PA President Mahmoud Abbas, who has since been legally replaced by Hamas). If you recall, Mitchell in the past (under Clinton) called for an end/freeze to all settlement activity – including natural growth. Natural growth being defined as making settler babies. Well, this settler is certainly going to be defying Obama and Mitchell on that one. My message to Obama and Mitchell is this. The Land of Israel belongs to the Jews, and will belong to the Jews, and we will prevail. And this Settler plans to personally double or triple the size of his settlement. Makor Rishon (D’yukan page 7) this Shabbat published the official protest from Rachel Imeinu’s media advisor officially denying the story that she appeared in Gaza and personally directed soldiers away from 3 booby-trapped buildings. According to the spokesperson, Rachel Imeinu has not participated in any military activities recent or otherwise in the past 3000 years. She has not communicated with any Golani or Tank soldiers, nor with senior officers in the Military Rabbinate, and since passing on, she generally avoids extraneous activities in this world. Of course she prays for the well-being of all Jewish soldiers in all generations. Until further notice, she has no intention of responding to any military call-up orders. And finally, Rachel Imeinu would like to mention that she passed on in the prime of her life, and takes exception to being portrayed as an old lady (Arab or otherwise). Regular scheduled blogging will continue next week. Over at the Muqata a number of commenters noted how unbelievable it was that Hamas claimed they killed thousands of IDF soldiers, downed some helicopters and kidnapped a few soldiers in the bargain. To those readers it is unbelievable because it is verifyably untrue. What they don't understand is how the truth plays no role in Palestinian storyline. Like the Pallywood story of Al-Dura or the so-called massacre of Jenin, the truth is a weapon to be manipulated in the war against the Jews, as after all the truth is what people are taught to believe it is. Tens of thousands of Arab children are raised on these stories in school and at home, and will believe it forever. For them Hamas will have been a victorious army that defeated the Zionist invasion, and the IDF massacred 500 women and children in Jenin (and let's not forget Dir Yassin). Thus this war is perpetuated forward into time immemorial. It's really quite simple and quite believable. Spot on in my case (Ichud Haleumi). What I found most interesting is where I agreed and disagreed with the various party platform positions. Chief of Staff Gabi Ashkenazi is really biting his tongue and not saying what he's thinking. In response to the cease fire, he made a comment this evening along the lines of "The campaign is not over and the coming days require us to stay organized [loaded], prepared and ready until quiet returns to our communities and cities." Probably the most you can get out of him in terms of stating that this ceasefire is truly idiotic. Hamas has put it into perspective when they gave Israel their demands for an IDF withdrawal from Gaza. Of course the world put it in perspective when then they demanded we allow the Gazan to have open borders to bring in whatever they want, and the latest is talk that the world will demand Israel rebuild Gaza. And of course Hamas is still shooting rockets. Incredible. We had Hamas on the ropes. We were winning unconditionally. There is no question we were on the verge of destroying Hamas completely, and then the political echelon comes along and pulls out the carpet from underneath the feet of our soldiers - just ahead of campaign time for elections. I don't think we've ever had a government in Israel that lost 2 wars (actually, I don't think we ever had another government that actually lost even one war in the end). And the worst part is, people will still actually vote for Kadima and Labor. Sometimes we deserve what we get. An exploratory drill 90 KM off the Haifa shore seems to have found 88 billion cubic meters of natural gas at the Tamar-1 test drill site. Current estimates state that the amount of natural gas found may be enough to make Israel energy independent for generations! This is a good thing, but I hope it doesn't turn us into a lazy nation living off our natural resources, as opposed to a proactive nation using our natural resources to build and develop even more. Yitzchak Tshuva is going to be an even richer man. If you think about it, this war with Hamas is more a reflection of what goes on in Arab society in general then about destroying Israel. Only if you understand the fiction that is called Palestine, can you then understand what is really happening in the Middle East. There has never been a Palestinian state, a Palestinian nation, or a Palestinian people. These are just recent developments and concepts that evolved more as a reaction to what I am about to discuss then from national evolution. Look around at all the Arab states such as Iraq, Syria, Saudi Arabia, and Lebanon. It’s all about internecine fighting and the control of one family, tribe or clan over another – and in general the brutal and oppressive methods of keeping that control. With the exception of Iran (established 1935, but was previously Persia) and Egypt, what Arab state even existed as an identifiably unique entity 100 years ago? Look at their dates of statehood: Saudi Arabia – 1932, Iraq – 1932, Lebanon – 1920, Jordan - 1946, Kuwait – 1961, Syria – 1946. Until then they were just a bunch of different clans and tribes under the fist of ever-changing rulers, often external ones, with no real individually unique national identity beyond Islam and Arabia. (Even Lebanon which had its period of semi-autonomy and identity was simply one family/tribe such as the Maans or Shihabs gaining temporary control over the other clans). The people of Palestine (as they are called now), a significant majority the descendents of immigrants from Egypt and the Syrian Levant less than 100 years ago, never had any uniquely unifying elements, history, or culture to join them together as a nation or people besides the same general nebulous Arab/Islamic tribal identity that permeates the entire Middle East. Until the Arabs attacked Israel and created the “refugee problem”, there was nothing historically unique about the Palestinian people to define them as a unique people, so these internal schisms that afflicts the rest of the Middle East affects these Arabs that also live in the Land of Israel. That affliction is the question of which tribe will rule (or at least have more control) over the others. And while on one hand you can claim that the division is between the Islamists (Hamas) and the Nationalists (Fatah), it reality they are almost all Islamists and Nationalists. Most likely it is due to urbanization, but the clan you are born into has become secondary as the extended family/tribal structure breaks down, while the paradigm of the tribe and clan remains in place. Instead of the traditional family-based clan, the organizational clan has replaced it as the typical clan structure (but not as a national clan concept, just a local one). And all the while, the model of one clan trying to gain superiority over the others is just as strong as ever. Hamas needs to fight Israel to show that it is the stronger clan than Fatah – no different than the Shiites and the Sunnis. Both (Hamas and Fatah) want to see Israel replaced by an Arab state, they just disagree on the methods, and which clan should have control. For all their whining, crying and big talk about Palestine, you don’t see a single other Arab nation coming to their aid in their war against Israel. First of all, Palestine is big in their minds of the Arab people simply because their rulers use it as leverage to keep control over their populations by redirecting their citizen’s anger frustration away from their oppressive and backwards regimes and against a third party enemy. But more importantly this war isn’t about defeating Israel. This is about which clan/tribe is going to defeat the other, Israel being incidental to this battle, and as such not the fight of the other Arab nations. Which brings us to the actual reason why Hamas is really still fighting. Shouldn’t Hamas have conceded defeat already? Well if this war was against Israel, then yes, that would be true, but this war isn’t against Israel. The IDF has frustrated Hamas’s plan to militarily wrest control of the West Bank away from Fatah. If Hamas can’t fight Fatah directly and take over the Fatah clan by force, then the next best thing is to win over the hearts, minds and imaginations of the residents of the West Bank and show them that they will fight the common enemy between them and for them – unlike the Fatah clan. Every day Hamas doesn’t give in just means more members of Hamas tribe for them in the West Bank (and among the Arabs citizens of Israel). No matter how bad their military losses, Hamas is achieving it goals of expanding the size of its clan simply by fighting and hanging on. Unless Israel realizes this and totally obliterates Hamas, Hamas will have won, and will expand much more easily throughout the land. Yes, militarily, Israel has unquestionably won, and this war will be taught in war colleges around the world as a classic case study on how a traditional military force can beat a guerilla army. But Israel did not achieve its objective of defeating Hamas (if that was its objective). And so while Hamas may have militarily lost this war – big time, they have achieved their objectives of remaining in power, showing they are the only clan (besides Hizbollah) to fight Israel, and most importantly expanding their fan base throughout the Land of Israel. In short, the Fatah clan remains in power due to the graces of the IDF. If the IDF were pulled out, the Hamas clan would be in control very quickly. And the answer to question at the top of this post is simple, there is no ruler in Palestine, because there is no a Palestine, just a bunch of clans and tribes fighting each other in a particular geographical region for control. One thing this country’s leadership have studiously avoided is actually defining their vision of victory in this war. In my opinion it comes down to 1 of two possibilities. Hamas loses its will to attack us ever again. Hamas loses its ability to attack us ever again. Option 1 implies either they will turn over a new leaf and become good neighbors, or will be in such psychological trauma from this, they will never consider it again. Obviously option 1 is still far away and as they still haven’t stopped shooting or trying to smuggle in weapons and it is clear that will never happen. Their ideology/religion will never allow them this option. Option 2 indicates a more realistic view of the situation. Hamas has no intention of, or capability to change its religion/ideology, and as such we need to impose our will on them entirely, ensuring they never again have the capability to attack us. That can be done by liberating Gaza (Jerusalem/West Bank model), or worst case continuing to keep soldiers in play over the long term and actively keeping their infrastructure destroyed (Afghanistan model). (Between Jerusalem (liberation) and Afghanistan (attrition), I think we know which model works better). Option 2 is obviously the better option. But for a left wing government option 2 poses a major problem – there is no exit strategy, and that is yet another nail in the coffin of their dead ideology that they keep trying to resurrect and pull out of its grave like the Frankenstein monster it is. So instead, they will settle for a temporary false quiet. Israel will accept Hamas’s terms for a cease fire. Hamas will use it to build up their military infrastructure even further (still spradically firing at us just to spit in our face), and using the lessons of this war to make the next one far more difficult, and we’ll be in this movie yet again within a couple of years – but on an even larger more difficult scale. Barak and Livni will use this false quiet to enhance their positions in the upcoming elections (“they bought/brought us some quiet”) and in the end nothing will have changed. When will we have some fearless leadership? There are a lot of competing interests in the Israeli government these days. Gabi Ashkenazi simply wants to win this war. Ehud Olmert wants to rehabilitate his image damaged from the previous war, and perhaps even come out ahead, so he is supporting Ashkenazi. Ehud Barack and Tzippy Livni want to get back to elections. Barack figures he's ahead of the game, so he wants to get out now and start campaigning. Livni has nothing to offer in this war, so she wants to get back to campaigning. No one understands Hamas and its motivations (unless the theory that Iran is using them as a diversionary tactic is true) and why they want to keep fighting and losing. It's funny. We're winning this war. I mean completely winning this war. But in the end we may very well lose simply because of the political interests of a few candidates who see more personal profit to themselves with not finishing this job (which is tantamount to have not started it in the first place). We really do need better leadership in this country. Obviously I don’t know what’s next for Gaza, but the solution seems pretty obvious. To begin with, it is estimated that there are around 15,000 active Hamas terrorists in their army, and we’ve only killed around a 1000 of them. The rest are hiding and blending in with their local civilian supporters. So if we pull out now, then Gaza is left with most of their army intact and alive, and free to rearm and restock. So that isn’t much of a solution. Giving control over to Fatah is a bad idea because they already lost Gaza once, and the only reason they haven’t lost the West Bank yet is because of the IDF (and have we really not learned yet, not to trust one terrorist organization over another for our security). Obviously the IDF will need to stay in Gaza to ensure that Hamas is unable to escalate and reestablish themselves. Of course that becomes logistically difficult. It means either establishing heavily fortified bases or pulling in and out of Gaza on a daily basis. Of course there is another solution. We can take back our towns that we built (did you know that there were Jewish towns in Gaza before 1948, but they were destroyed by the Egyptians?) and rebuild them. This is a model that has worked in the past and would work again in the future. Obviously this government would never consider such a logical, militarily sound solution, but if they would, this would be it. Dennis Prager raises an interesting question over at TownHall regarding the definition and values of the Left and how it doesn’t mean what it used to, and as such, why does Alan Dershowitz continue to identify himself with a term that has become synonymous with rabid anti-Semitism? Following that, I’m astounded that some Liberal Jewish bloggers and commenters actually recommend that Israelis absorb endless rocket attacks and attempts at a mega terror strike as opposed to wiping out the terrorists – specifically because we might kill some enemy civilians in doing so – particularly when a well known and thinking Liberal like Dershowitz would rail exactly against that kind of thinking. But let’s go beyond this Universal Humanistic philosophy that implies that Jews shouldn’t properly defend themselves if a member of an enemy population might get hurt or killed (even if it is because of the actions of their fellow countrymen). In Judaism we have the concept of mutual responsibility (for good and for bad) within one’s society. Yet, those on the Left would apply that concept only to Jews and deny this concept to others – a double standard for sure. But that is only the tip of the problem, because the further Left one goes, the further they claim to support “Human Rights”, and the more they want Jews to be killed and murdered. Look at all these leftwing protests around the world. So many of them are holding up signs demanding that the Jews be killed or gassed, and those around them are not protesting these calls for genocide. Is that really the viewpoint of a liberal, humanist or pacifist? Obviously not. Or perhaps nowadays, apparently so. What was once Left, is simply now a socially acceptable cover for rabid Antisemitism. It bothers me that my fellow Jews on the Left don’t realize that they are associating ideologically with people who may actually want them dead, and that they are absorbing foreign philosophies that are detrimental to their own long-term welfare – if those on the Left would have their way. If you want to be Left, at least be Left like Alan Dershowitz. He has self respect as a Jew – even if he is wrong on other things. And please, don’t come to this blog to try to convince anyone that the IDF is doing anything immoral in the way it is fighting this war. I will erase those idiotic comments. I was led to believe that my previous blog layout was a little to harsh on the eye. So I took a few minutes today away from updating the Muqata and redid it. I know many of you come here for my insightful insights from the insiders view of a Jewish Settler. As I am helping update the Muqata blog and twitter war reporting around the clock, that is taking up a significant amount of my free time, so I am not able to write as much as I want. But keep checking in. When I have time to write something important and relevant, I will post it. Who's in Charge over there? Today officially marks the legal end of Abu Mazen's presidency. According to PA law, Hamas now controls the Presidency of the Palestinian Authority - including within Palestinian Occupied Judea and Samaria (West Bank). Will Mahmoud Abbas (Abu Mazen) step down? Will Hamas fight to take control? Who does the (American trained) Palestinian Police now take orders from? Will America demand that PA law be upheld and Hamas legally take over, or will it demand a coup and keep Abu Mazen in power? Just received this spoof in the mail. Click to read it in full size. There's more on their website. Ha'aretz is in hunting season. This time they are going after big game. They've got a judge in their sites. Jerusalem judge Malka Aviv has made a series of rulings that Ha'aretz doesn't like, for instance that demanding that the police protect a Jew who wants to visit his property in a bad side of town, as opposed to not letting him get to his property. I guess you can say it is a bit ironic that this government is trying to overthrow Hamas (a violent regime) and replace it with Fatah (a corrupt regime) in Gaza (but are simply to embarrassed to admit it publicly). Hamas terrorists tried to kidnap a soldier by dragging him down into one of their tunnels. 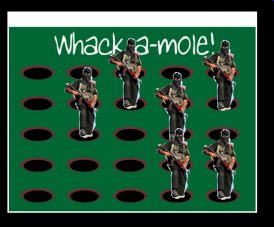 The Hamas terrorists seeing to overwhelming force that entered the private home (also used as a Hamas command center), ran back down into their rat hole dug inside the home. One Golanchik jumped into the tunnel, crawled after the terrorists, killed them all, climbed out and rejoined his unit. I don't think there is a medal big enough for this guy. (I wonder what Hesder Yeshiva he learns in). (The alternative version of this story, is that the soldier was actually kidnapped, and killed all his captors and then rejoined his unit). From the Muqata 10:55 PM Channel 2 Israel TV reports that most of the wounded (57) IDF troops are either settlers or Religious Jews. There is no denying the "National Religious" Jew is taking the lead, yet again, in defending this country. I take great pride in that we have taken this role on ourselves, but it disturbs me that we wouldn't be in any of these messes in the first place if the "National Religious" Jew were also the ones leading this country politically, instead of those people with their warped theories and philosophies. It really is time for a political revolution. And while it is still a long ways off, one can hope that people like Ketzaleh and Feiglin continue to fight to position our camp where we belong - and eventually succeed. Now that Hamas can officially reach Tel Aviv with there medium range missiles, residents of that city may soon find themselves seeking shelter. In Nitzan, the government finally decided to set up a protective bunker system for the Gush Katif refugees... sort of. To me it looks like sewer pipes with a concrete barrier set up at both ends. It probably looks that way to me, because that is what it is. 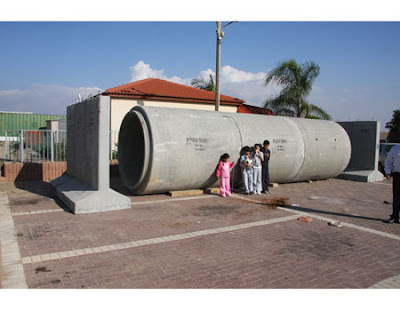 Obviously, they aren’t going to bring in thousands of concrete sewer pipes into Tel Aviv, that would be too difficult. I assume they will just open up the main sewers and tell the residents to go hide inside. By the way, if you zoom in on the picture, you will figure out why these sewer pipes aren’t rolling away. They stuck some wood blocks underneath. Gush Katif Evacuee Rachel Saperstein, living in Nitzan, wrote a piece about it in the Jerusalem Post. It never ceases to amaze me how self-flagellating the Left can be. Ads are appearing all over Israel by Meretz and others demanding a “cease fire now”. The alternate reality these people live in astounds me. We have had a supposed cease fire these past 6 months, all the while rockets and mortars were still lobbed on us. During that time, Hamas used our fear of fighting them to build up their missiles so they can reach Be’er Sheva (and according to some sources, even Tel Aviv - yes, you read that here first). How do they consider a cease fire a good thing? Do we need to give them time to smuggle in more missiles and perhaps even an Iranian dirty bomb in? But that isn’t the question. The question is why are the Left so obtuse, and so stuck in their fantasy that if only WE took some specific unspecified action (or inaction) we would have peace.